In Modelling Scotland’s Railways, Ian Futers has provided an excellent guide to recreating the railways of Scotland in miniature. I’ve admired Ian’s modelling for many years ever since seeing his 4mm ex North British layouts at the annual Newcastle MRS exhibitions in the 1970s and the book is everything I’d expect from someone who has captured the atmosphere of so many real and ‘just supposing’ railway locations. Modelling Scotland’s Railways is a comprehensive work and includes history, service patterns, buildings and structures drawings, prototype and model photos, and layout themes from pre-Grouping to modern day. Chapter two “Quintessentially Scottish Railways” looks at the architecture and practices of each of the pre grouping Scottish companies, really bringing home the things a Scottish layout needs to get right to be convincing. 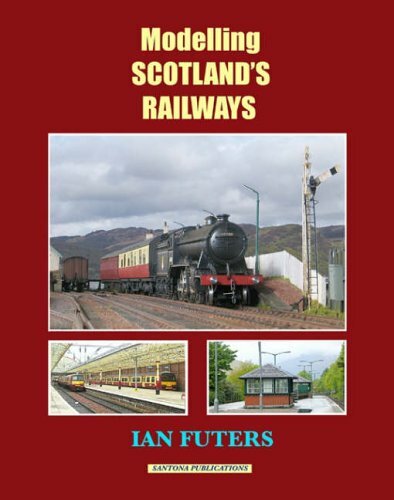 Modelling Scotland’s Railways, and the follow up title Scottish Layout Projects are great books for anyone interested in modelling the scottish region. I really like Ian’s style of writing, very easy to read. interesting and informative.